firstsite announces the first major survey of the work of Bruce McLean (b. Glasgow, 1944). Tracing the career of an artist who was at the forefront of the development of Conceptual art in Britain in the 1960s, the exhibition will feature over 100 works across 5 decades including working drawings and photographs never previously exhibited. Sculpture, painting, photography, drawings, ceramics and film will be presented across seven galleries occupying 855 square metres. Characterised by wit and an often ironic sensibility, Bruce McLean's work has employed a range of media since the late 1960s. Often considering 'the condition of sculpture', McLean has explored the parameters of what a sculpture could be and tested conventional definitions, modes of production and display. These investigations have acted as a critique of social and academic hierarchies at work within the production and exhibition of contemporary art. A student of Anthony Caro and Phillip King at St. Martin's School of Art, London, McLean was a leading Conceptual artist who challenged the formalist tendencies that were upheld by his tutors. During the late 1960s and early 1970s, he adopted an unconventional approach that often involved working outside the studio or gallery to produce works in the natural or urban landscape. This exhibition will include key examples of his Street Works, Floataways, Shoreskapes and Rockskapes photographic series, which placed process and production at the heart of his endeavour. Other early works, including Mirror Work, Barnes Common (1969); Installation for Various Parts of the Body (1969) and Pose Piece for Three Plinths Work (1971), introduced the notion of 'pose' and an approach to using the body as sculptural material which he explored further through live action and performance in the 1970s, most notably as part of Nice Style, 'the World's first Pose Band'. The exhibition will also present a number of recent paintings alongside significant works from the 1980s and 90s, including Ambre Solaire and Going for God II (both 1982), two of the largest and earliest works on canvas, and Jaffa Jaffa Jaffa (1991), a four-metre long painting on steel panel. The exhibition will feature one of McLean's major public commissions, a 5.5-metre high steel sculpture entitled Ludgate Head (1992), originally sited on Fleet Place in the City of London. A selection of films will be shown in timed screenings in the auditorium in addition to gallery presentations of Urban Turban (1994) and In the Shadow of Your Smile Bob (1971), a film that McLean made in response to a photograph of the artist Robert Morris that was published in the catalogue for the exhibition When Attitudes Become Form (1969). The exhibition draws upon public and private collections in the UK and Europe, including the Arnolfini, Bristol; the Arts Council Collection; the British Council; British Land; Museum moderner Kunst Stiftung Ludwig Wien, Vienna; David Roberts Collection, London; the Scottish National Gallery of Modern Art, Edinburgh, Tate and Walker Art Gallery, Liverpool. The exhibition builds upon renewed critical attention and follows a solo exhibition of early and recent work at Leeds Art Gallery, Bruce McLean: Another Condition of Sculpture (15 February ' 11 May 2014). It is supported by the Henry Moore Foundation. A 208-page monograph, edited by firstsite's Senior Curator, Michelle Cotton, will be launched during the exhibition. It features new essays by Clarrie Wallis, Curator of Modern and Contemporary British Art, Tate Britain and Michelle Cotton and an extended interview with the artist. These are accompanied by over 100 illustrations including new paintings, previously unpublished drawings, posters and ephemera. Covering a period of almost 50 years, it will be the most comprehensive publication on McLean's work to date. Bruce McLean (b. 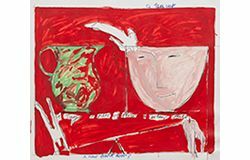 1944, Glasgow) studied at Glasgow School of Art from 1961 to 1963, and then at St. Martin's School of Art, London from 1963 to 1966, where he was taught by Anthony Caro and Phillip King. From 1966, he has held teaching posts at Croydon School of Art; Maidstone College of Art; Stadelschüle, Frankfurt; Rijksakademie van Beeldende Kunsten, Amsterdam; and the Slade School of Fine Art, University of London, where he was Head of Graduate Painting from 2002 to 2010. Solo exhibitions of his work have been held at Leeds Art Gallery (2014); The New Art Gallery Walsall (2010); Chelsea Space, London (2006); Talbot Rice Gallery, University of Edinburgh (2000); Norwich Gallery (1996); Arnolfini, Bristol (1990, 1980); Henry Moore Sculpture Studio, Toronto (1990); Tate Gallery, London (1985, 1972); Whitechapel Art Gallery, London; Institute of Contemporary Arts, London (1983); Van Abbemuseum, Eindhoven (1982); Kunsthalle Basel (1981); Third Eye Centre, Glasgow; Fruitmarket Gallery, Edinburgh (1980); Museum of Modern Art, Oxford (1975); and Nova Scotia College of Art Gallery, Halifax (1970). His work has been presented in significant survey exhibitions, including documenta 6 and 7, Kassel (1977, 1982); Zeitgeist, Martin Gropius Bau, Berlin (1982); A New Spirit of Painting, Royal Academy of Arts, London (1981); Information, Museum of Modern Art, New York (1970); Op Losse Schroeven, Stedelijk Museum, Amsterdam (1969) and When Attitudes Become Form, Kunsthalle Bern (1969). He was awarded the John Moores Painting Prize in 1985, and currently lives and works in London.